It’s official name is the Ponte dell’Accademia and in addition to being one of the most photographed bridges, it is also a very useful crossing along the Grand Canal. It connects Dorosoduro Sestiere to San Marco Sestiere and makes a great shortcut into the historic center. The yellow building in the background is the Palazzo Cavalli-Franchetti and today is the home of the Institute of Science, Letters & Art. It provides a magnificent view of the Grand Canal looking toward Santa Maria delle Salute (which faces San Marco Square). 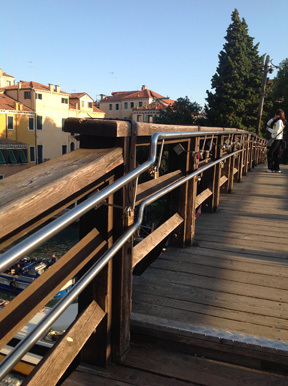 Over the years, we have watched the eclipse of the moon from the Accademia and the end of the Volgalonga (30km paddling/rowing boat race through the Grand Canal & around the lagoon) and crossed it on the way to friends houses but never noticed the small locks attached on the bridge. It is a crowded mass for the Redentore Festival as it has a great view of the skies where the fireworks appear. 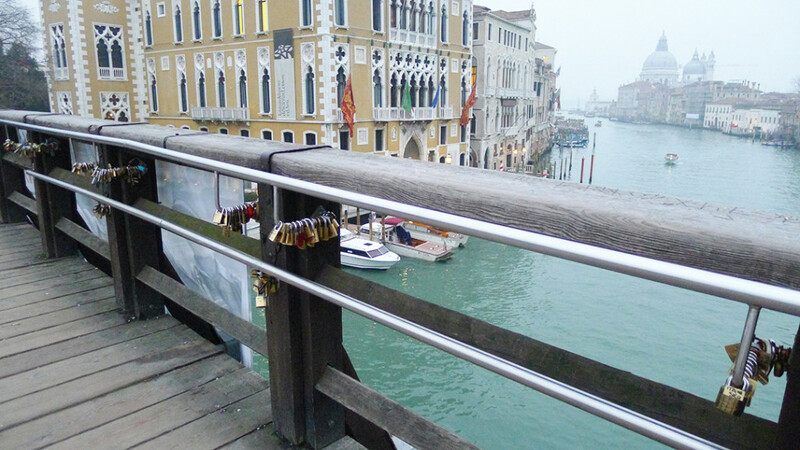 Officially, it is discouraged by the city, but can you imagine a more romantic gesture than to place your LoveLock (sometimes called Love Padlocks) along the Grand Canal looking our towards the lagoon! It is afterall, one of the most romantic cities in the world. There are online stores for these locks where you can also have your name and the special date engraved. But not to worry, in Venice, always the Merchants, the illegal street vendors are now more than willing to take your money for a lock. Take a sharpie pen and you are set. Just don’t get caught buying from these guys or putting the lock on the bridge. This tradition is said to have originated in Serbia before World War II. However an Italian book and film entitled “Ho voglia di te” (I Want You, 2006) by Federico Moccia rejuveniated the custom in Rome and spread around Italy and the world. They can be found on the Ponte Milvio in Rome. Lovers inscribe their initials and the dates on the locks vowing eternal love, place them on a romantic or special location, lock them and disappear with the keys or sometimes toss the keys into the waters below. Naturally city officials don’t see it as art, rather as damaging the city bridges and have attempted with varying success to remove them. In Paris, they may be found on the Pont de l’Archeveche. They were removed once by an art student who needed material for his project, however they began re-appearing immediately. In Florence over 5,500 love padlocks were removed from the Ponte Vecchio bridge. But as soon as they were removed, more locks began to appear along with the illegal street vendors who sell them. In Germany, in Cologne, the Deutsche Bahn (Train operator) threatened to remove the locks from the Hohenzollern bridge but gave up because of the opposition by the people. In New York, the Brooklyn Bridge is the popular location. In Moscow, along the bridge crossing the Vodootvodny Canal the city installed decorative iron trees which promptly were completely covered in locks. They are even found in Taiwan, known as “wish locks” they are placed on a bridge above a train crossing with the hopes that the magnetic field of the trains crossing underneath will give the locks special energy to fulfill their wishes. Now that we’ve discovered them in Venice, we’ll keep updating the pictures, to see how many have been added. 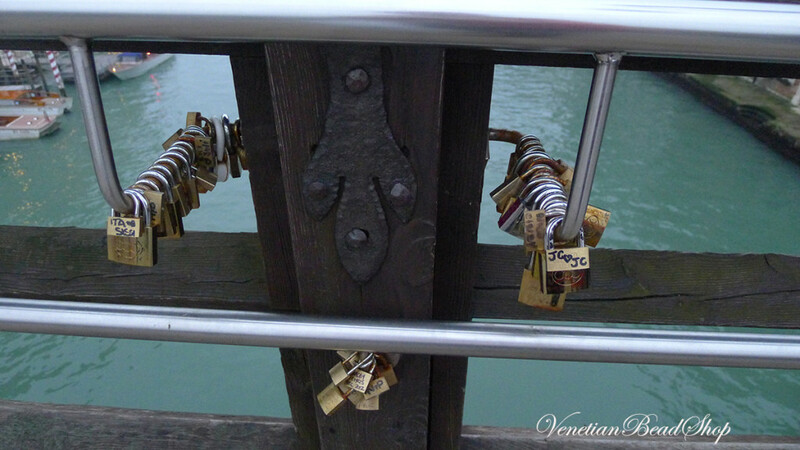 If you sight any love locks near you, send us pictures and we’ll post them.